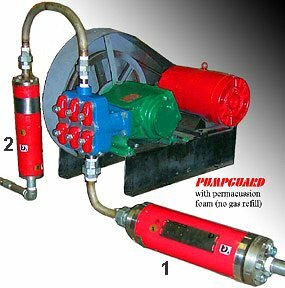 pulsation dampening multiplex power pumps. API 674 with PULSEGUARD "pulsation suppression devices"
Discharge pulsation often comes from poor suction conditions. (4) PipeHugger up to 3" pipe. The ultimate in high frequency negative transient prevention stops suction side bubble generation. Guards against pressure wave generation. For pipe systems 3" diameter through 12". WaveGuards have no moving parts, and no foam to clog and degrade. The WAVEGUARD disperses pressure transients over a longer time base, and reduces their amplitude. WaveGuards are not flow fluctuation accumulators. Guards against pump suction cavitation. For pipes 3" diameter through 12" diameter. PumpGuards have no nitrogen or air pre-fill or pre-charge requirement. Whenever possible use a bend with radius not less than 5 pipe diameters. "A 5 D bend"
* Pressure pulsation, travels through out a system at near 4000 miles per hour, say 300 faster than flow velocity. Catching pressure waves traveling faster than the fastest bullet, requires intercepting them. PulseGuard PIPEGUARD Pig/TW series "flow-through" dampers have intercepted pressure pulsation since 1965, and are proven 300% more efficient than copies with only one connection. And 250% better than copies with add on false flow through bottoms. Ex stock - 1/2" through. 2.5", 500psi - 15,000 psi all stainless. A "septuplex" reciprocating 7 plunger pump, with each 180 degrees of displacement being overlapped by 128 degrees, has "no" flow fluctuation, but lots of VALVE ACTION. * How many once connection silencer mufflers, filters, capacitors, have you seen?